Human activities such as fragmentation and selective logging of forests can threaten population viability by modification of ecological and genetic processes. Using six microsatellite markers, we examined the effects of forest fragmentation and local disturbance on the genetic diversity and structure of adult trees (N = 110) and seedlings (N = 110) of Prunus africana in Kakamega Forest, western Kenya. Taking samples of adults and seedlings allowed for study of changes in genetic diversity and structure between generations. Thereby, adults reflect the pattern before and seedlings after intensive human impact. Overall, we found 105 different alleles in the six loci examined, 97 in adults and 88 in seedlings. Allelic richness and heterozygosity were significantly lower in seedlings than in adults. Inbreeding increased from adult tree to seedling populations. Genetic differentiation of adult trees was low (overall F ST = 0.032), reflecting large population sizes and extensive gene flow in the past. Genetic differentiation of seedlings was slightly higher (overall F ST = 0.044) with all of the 28 pairwise F ST-values being significantly different from zero. 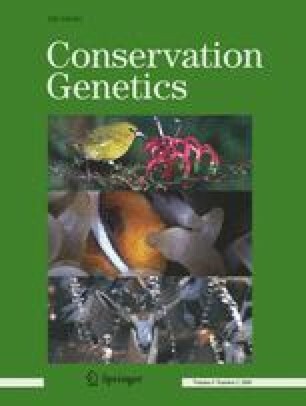 These results suggest that human disturbance in Kakamega Forest has significantly reduced allelic richness and heterozygosity, increased inbreeding and slightly reduced gene flow in P. africana in the past 80–100 years. We thank the Kenyan Ministry for Education & Research for research permission, the KWS and FD for granting us access to their reserves, Jasper M. Kirika for help with field work and Bärbel Bleher for support. We are grateful to D. G. Berens, T. Diegisser, E. M. Griebeler, J. Johannesen, F. A. Voigt and two anonymous reviewers for comments on earlier drafts of the manuscript. Financial support was provided by the BMBF (Biota East Africa 01LC0025/01LC0405).